I learn a lot of lessons from my 5-year-old daughter. Gone are the days of keeping her happy with a poke of the belly or a sneaky game of peek-a-boo. She is growing up, after all, and quickly developing a discerning eye for dad’s bag of tricks. Of course, that means she also knows the difference between, say, a chocolate chip cookie and an ice cream sandwich. Or the difference between a decades-old, hand-me-down teddy bear and a sparkly new princess doll with matching outfits. Even though she is still in preschool, she understands quality. She is no longer satisfied with average. Just good enough isn’t good enough anymore. She wants the biggest, best or most delicious version of anything. And let’s just say she knows how to work the system. But, really, she is no different than the rest of us. A company like Starbucks thrives because they offer more than just coffee. They offer a great quality product in a great quality atmosphere. In our family, most day-to-day purchases are made online through Amazon. My wife loves Amazon because their prices, efficiency and customer service are all extremely high-quality. In veterinary medicine, quality should be more than just an added value. Unlike human medicine, veterinary medicine does not have the same legal standards or requirements that guide quality control. And the scary truth is that there are practices out there that take advantage of that lack of structure. That is never OK. All patients, whether their name is Fido or Frank, deserve the best care and service. And when it comes to cancer care for pets, quality control is an absolute necessity. When dealing with the kind of advanced treatments and technology that PetCure Oncology offers on a daily basis, an unwavering commitment to quality control is crucial. 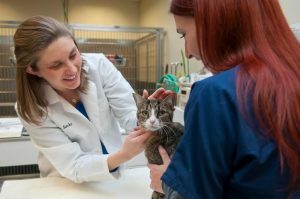 It is a priority that our cancer care centers operate by rigid protocols to ensure our furry patients are provided the same quality treatment and service that you would expect at a human hospital. Quality is not something we provide some of the time. It is not something we get to if we can. It is a core element of our commitment to providing pets with the best treatment possible. 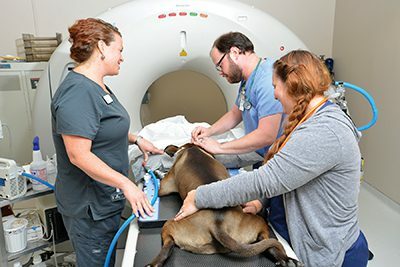 A customized radiation therapy treatment plan is created for each patient by a board-certified veterinary radiation oncologist and reviewed by a second board-certified veterinary radiation oncologist before being approved. Accordingly, a minimum of two board-certified radiation oncologists are involved in every case. Each plan is then verified by advanced treatment-planning software. Prior to every treatment session, a physical inspection of the equipment and its settings are conducted. And, each treatment is delivered by a radiation therapist licensed for human medicine or a specially trained veterinary technician who is skilled and experienced in the delivery of advanced radiation therapy with a linear accelerator featuring RapidArc® technology and on-board imaging. We pride ourselves in utilizing some of the most scientifically advanced technology, combining the best available equipment with software like EclipseTM and Radialogica, which enable our clinical teams to deliver treatment with precision, safety and efficacy. A lot of that may sound like jargon. Well, a lot of it is jargon, but no less true. Exceptional quality control is what allows us to treat your pet with the best quality in the industry. As pet owners, we want the best for our pets. With all the happiness they bring into our lives, they deserve it. Learn more about how PetCure Oncology is working to make a difference!